My music is an evolution in Afro-Cuban Jazz. I am connecting two worlds: the world of Jazz with Be-Bop, Hard-bop, Free jazz, funk, gospel, rhythm and blues, and the world of Cuban music with rumba and Yoruba rhythms coming from African slaves. I build bridges between styles, influences, and instruments. My music is hybrid. I play with Cuban musicians but not only. I need to feel diversity also in the band. My music is the celebration of rhythm, harmony and life. I was born in Matanzas, Cuba. Since I was a child I was listening to the Jazz LPs my father was bringing back from his business trips in Europe and Canada. Influenced by my uncle I dropped out of my engineering studies to immerse myself into music, and I started to study saxophone, a passion that is guiding my entire life. I first played with Talla Extra, accompanying Xiomara Laugart, with whom I recorded twice. I toured with the pianist Pucho Lopez in Canada. I collaborated with Afrocuba and Klimax directed by Giraldo Piloto. Then I joined the famous band Cubanismo in a world tour and recorded an album with them. Later I played jazz fusion with Four Runners in collaboration with Dario Moreno, with whom I recorded two albums and won the Best Album at the Music of Andalusia Awards. I played around the world at the New Morning in Paris with Orlando Poleo, at the Montreux Jazz Festival with Klimax, at the Jazz à Vienne Festival, Nice Jazz fest, Montréal and many more in Tahiti, Japan, Spain, Mexico with Cubanismo. I contributed to more than 20 records. While collaborating, touring and recording with major bands I started to feel the need to work on my own music and to go beyond my Cuban roots into a personal quest of my Identity and my Origins. In 2002 I released IDENTITY first CD as a leader featuring Omar Sossa, Sherman Irby and Tata Güines. The CD received very positive reviews worldwide and was selected in the top 10 Latin jazz album of the year by French Magazine Jazz Hot. In 2005 the Star Tribune of Minneapolis compares my tenor saxophone solo to one of the level of Micheal Brecker. 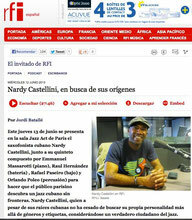 In 2010 I felt ready to launch a new CD and I released ORIGENES with the Nardy Castellini Quintet. The Album uncovers a new direction in Cuban jazz with ancestral Afro-Cuban rhythms fusionned with jazz. In 2012 I joined the World Tour of Rodrigo Y Gabriela and C.U.B.A in an incredible world tour of 46 concerts in 7 months including 3 major TV shows, amongst them Jay Leno. Since 2012 I am working with a new group of musicians in Paris including Orlando Poleo. We are playing in different places in Paris and I am working on new compositions. We played in Corsica, Geneva, and Nantes early in the year and we are ready for much more in the second part of the year.